Welcome to Urban Canvas, a green toy company that aims to inspire and delight children through art activities and creative play while being environmentally responsible. All our products are conceived with the simple idea that what is good for the environment is good for our children, and that what they learn in the arts helps them grow intellectually. 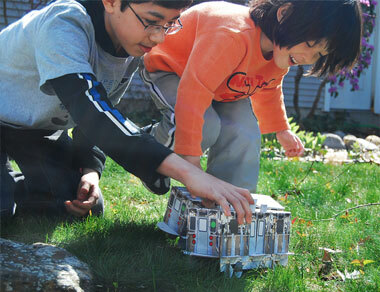 Our eco friendly toys are sculpted out of cardboard, a durable recyclable material that is also reversible and reusable. These buildable toys are dual sided. One side features an image collage that reflects Urban Canvas' modern aesthetic, while the reverse side can be used as a canvas for kids to design and decorate. The end result is a fun educational toy that can be played with over and over again, but when not in use can be proudly displayed as a sculptural art piece.